Hackathons are idea-generating events that have been sweeping the start-up culture all over the U.S. and is also gaining momentum in Singapore in hopes of uncovering the next industry-disrupting idea. A hackathon can last from several hours to days and it gathers people from diverse backgrounds (usually developers, entrepreneurs, designers) who come together in teams to work on ideas within the confines of a theme. These sessions usually end in demonstrations presented on the last day and sometimes they announce a winner for the best idea. Whether it is a large-scale hackathon or a small one, an event where the end objective is to present an awesome new idea or even a working prototype is sure to burn through brain cells and drive hunger. 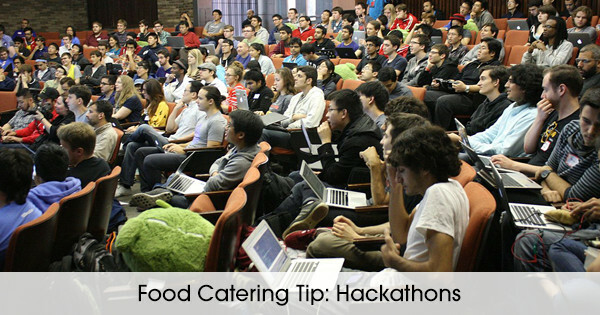 Planning for meals that fuel the brain is a really important part of running a successful hackathon so choosing the right caterer in Singapore is absolutely essential. The caterer has to be flexible enough to adapt to hackathon events because they can be unpredictable e.g. they may run long, last minute attendees who have special requirements. The food catering company also need to adhere to Singapore’s food safety standards set by the NEA. Let’s talk about what should be in the main course…. good options are pizza, sandwiches, food bentos, sweet crepes or a even a buffet spread. Mains are usually served hot and should be served immediately. Leftovers should be cleared for food safety. Quantity-wise it will take a some guesswork if you have an open invitation for the Hackathon with no accurate estimate of the final headcount. You can talk to the catering company to provide you with estimates because they usually have exposure serving at such events and they can help you in that aspect. In between mains, make sure you have enough snacks and lots of water, caffeine or energy drinks to keep the hackers going. Serve coffee and tea if it is an early event. People have woken up just to attend your hackathon and a shot or two of caffeine will be just the right thing to start their engines going. Pair the coffee with some light breakfast food like toast, cereal and a list of yummy food from the list of Southeast asia food. Singapore is a diverse country so you should take care of vegetarian, vegan, Halal and other food requirements as best as you can. Getting good vegan food is usually a little more challenging, but not impossible. A report shows that the most popular Hackathon dish of 2014 was cream potato bake. Even if you have vegan dishes in the menu, everyone is going to have a taste if it tastes great! When it comes to allergies, try your best to provide, but if you are unable to comply, make sure to let the attendees know so they are able to make their own arrangements. Make sure to label food items so that attendees know what they shouldn’t consume. Slightly over-order the food. It might not sound like a good decision because seeing food going to waste that you have to pay for is never an easy thing. But honestly, nothing can be more embarrassing than finding out the attendees had to go through a hackathon on empty stomachs. Hackathon attendees, especially developers, are known to be ravenous when it comes to developing a new idea within a short period of time, so make sure you have enough supply of food. Stay on budget because it is easy to go off track when it comes to ordering food. Let the caterer know about your budget so that they can help you plan accordingly. It is not just your guests who are important to serve, you need to have enough food for the event organizers and volunteers too. If there is left-over food, pack it up and give some to your team as a good gesture – of course, check with your caterer which is safe to bring home.